I've been after a copy of this particular 7" for well over a decade. Now the long search is finally over and perhaps thanks to a listing typo, it wasn't expensive either. 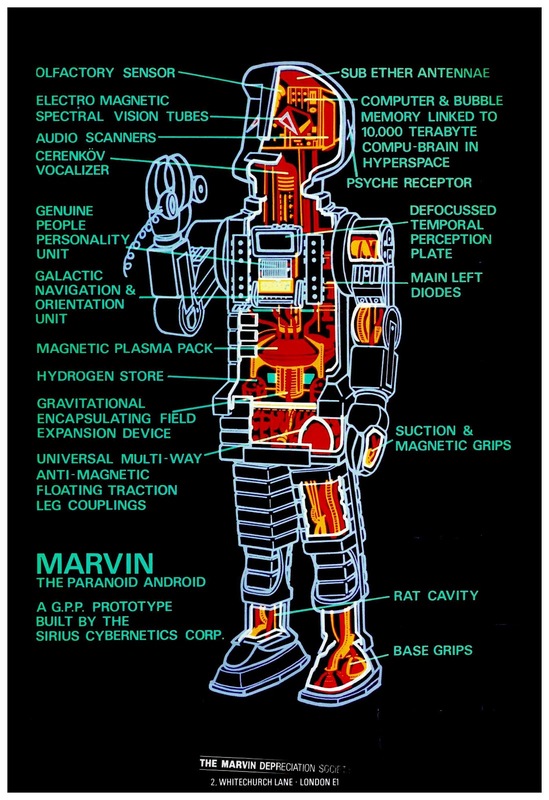 So enjoy with me won't you, the depressive synth-pop stylings of Marvin the Paraniod (sic) Android, as he performs the Big-Bang Burger Chef jukebox favourite "Reasons To be Miserable" and the haunting "Marvin I Love You". You can find Marvin's first single over here. I love this 7''. Thanks! Out of interest, did you get this from Evesham? (I spotted you're in Worcestershire - I'm just over the border.) 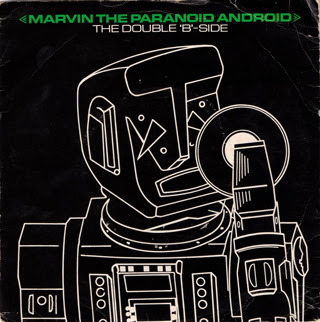 A bloke with a record shop there had one of the Marvin singles listed amongst his stock for yonks, but was never able to confirm which one it was, as he didn't keep it in the shop! As it happens I got it from a chap in NZ via the old ebay. The first single crops up quite regularly but the 'Double B Side' must be a fair bit rarer. Talking local record shops - have you checked out the new one in Great Malvern, Carnival Records? Nice friendly place, very good on fresh vinyl, had a wide selection on Record Store Day. The owners are pals with some of the members of Broadcast. They've done a couple of in-store DJ spots which I missed sadly.